At last, Juan Martin Del Potro met His Holiness Pope Francis, the first Pope from South America and a fellow Argentine, after attending Mass at the Vatican on Wednesday. 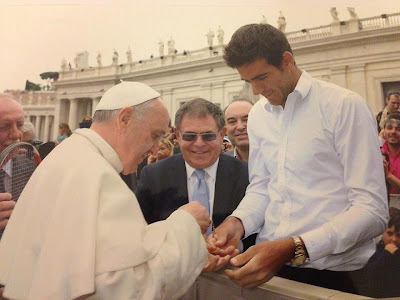 "It was an incredible experience with Pope Francis, something that I'll never forget,” said del Potro according to an ATP Tour press-release. “It was a dream come true for a guy like me. It was an unforgettable moment. I was very nervous before meeting him, to be able to congratulate him and talk with him. He was nice. Everybody knows he is very humble. Today was a day that I'll remember for ever." Del Potro was thrilled with the Pope's nomination back in March and was planning to meet His Holiness in Rome during the Masters. And to his surprise, Del Potro was recognised today by the Pope in the crowd after the Mass. "He told me that he knew I was playing at the tournament in Rome, he blessed me and wished me the best. I congratulated him and thanked him for the opportunity to talk to him." The World Nº7 gave the Pope a racquet used during his 2009 US Open final victory over Roger Federer.